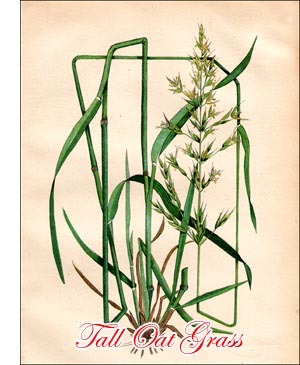 Other English names: Oat Grass, False Oat Grass, Meadow Oat Grass, Tall Meadow Oat Grass. Tall Oat Grass is perennial with a short rootstock from which leafy stems and sterile shoots develop. Sometimes the rootstock is swollen and the shoots bulblike at the base. The rootstock being short, the shoots become crowded and the plant therefore grows in tufts. These are, however, rather loose. The stems are from two to five feet high, often knee-bent at the base, generally dark green. They are leafy to above the middle. The leaves are long and broad, rather soft in texture, and usually bright green, almost yellowish. When mixed with other grasses, Tall Oat Grass may be recognized by this peculiar colour. The flowers are in a spreading panicle, which somewhat resembles that of oats - hence the name Oat Grass. The general appearance of the spikelets is also similar to oats. Each spikelet contains two flowers which are very unlike. The lower one has only stamens, is consequently sterile, and its glume bears a long, bent awn; the glume of the upper one has generally no awn, both stamens and pistil are developed, and the flower is thus fertile. Each spikelet consequently produces only one grain. Rarely both flowers are awned and sometimes a third flower is developed above the two normal ones. Stamens and pistil are ready for fertilization at the same time. There is therefore a chance for self-fertilization, although cross-fertilization is probably quite frequent. Tall Oat Grass is indigenous to the greater part of Europe and to northern Africa and western Asia. It was introduced into North America from Europe. It grows in meadows and on hills, in open fields and in openings in woods, along seashores and on mountains. Tall Oat Grass can be grown on almost any kind of soil, provided it is fairly moist. It does well on high, dry, gravelly soils, but will not make a satisfactory growth on very wet ground. It gives the best returns on light, moist loams and on clays not too stiff and wet. As the roots go deep, it will stand considerable drought. It is fairly winter hardy. It is rather easy to secure a good stand of Tall Oat Grass. The young plants make a vigorous and rapid growth, sometimes producing flowers the first year. If competition with other grasses is not too keen, it is productive for many years. Tall Oat Grass starts early in the spring and requires about the same time as Orchard Grass for its development. When grown for hay it does Well when mixed with Orchard Grass, Meadow Fescue and Red Clover. As it grows in tufts, it should not be sown alone but always with other grasses. It should be cut when in bloom if used for hay. If left only a few days after flowering is over, its feeding value is considerably lessened as the stems get hard and woody and quickly lose their nutritive constituents. Tall Oat Grass makes a quick start after cutting and stands pasturing Well. In spite of this, it is not as suitable for pasture as for hay, because the green plants have a rather bitter taste Which makes them unattractive to stock until the animals are accustomed to the flavour. In a pasture it should therefore be used only in small quantities with other forage plants. When grown alone for hay or pasture, thirty to thirty-five pounds of seed should be sown to the acre. When grown for seed, Tall Oat Grass should be cut as soon as the spikelets begin to take a yellowish tinge. Like Wild Oats, it drops its seed very readily, which makes early cutting advisable. The seed may be harvested and threshed like oats. Good commercial seed is greenish-yellow with a brownish or reddish tint. It weighs about ten pounds per bushel.